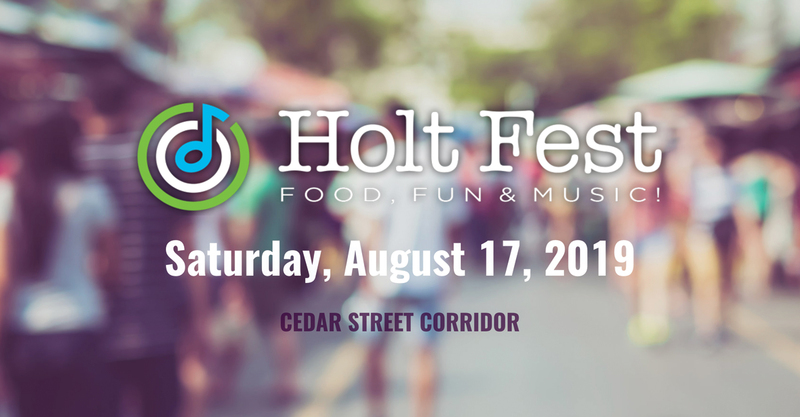 Holt Fest — formerly known as the Holt Hometown Festival — is back this year with the same hometown charm, but now with a different location. The festival, now in its 20th year, was moved from its former location at the Holt Jr. High School to the Cedar Street Corridor to highlight infrastructure improvements as a result of the Realize Cedar project. Festival goers can enjoy live music and family-friendly activities at the Holt Farmers Market, Veterans Park (Memorial Gardens) and Amphitheater, and the Senior Center properties. The festival will kick off with a parade down Cedar Street featuring the Scottville Clown Band. The live music performances will continue for the rest of the day on the two festival stages. Headlining the Farmers’ Market stage is the “The Ultimate Rock Show” Tribute Band at 8 p.m. and headlining the Veterans Park stage will be Ashley Lynn & The Spurs Band at 6:30 p.m. Along with the live music, there will be 20 different food vendors offering everything from BBQ to ice cream, the BeerWorks Craft Beer Tasting Tent (for those 21 and older), ArtSlam, unique artisans and crafters, inflatables for the kids, the annual Delhi Township Water Quality Awareness event, and Touch-a-Truck. The Senior Center will host an Elvis tribute act for Delhi Township seniors (age 55 and over), as well as their annual Ice Cream Social. At the end of the night, the festival will close with a Laser Light Show. This year, there will be a free shuttle bus that will run from the Holt Jr. High School during the day and throughout the evening to bring festival goers to and from all of the action. A Holt Fest Guide will be available, featuring a map of the shuttle drop-off and pickup locations, the parade route, live music schedules, food truck/food vendor locations, restrooms, etc. These colorful guides will be made available prior to and during the festival. Businesses, organizations, and community members can get involved as sponsors, vendors, and volunteers, as well as participate in the parade with a float or banner. This year, the organization with the best float will be awarded a $500 prize. Vendor, sponsor, and parade applications will be available on our new website. Additionally, volunteer opportunities will be available for those wanting to help with parade lineup, entertainment stage areas, etc. Volunteer information will also be posted on our website. For more information, visit www.holtfest.com.